Republic of Ireland manager Martin O'Neill has told his players to have "no regrets" after their Euro 2016 qualifier against Germany on Thursday. A win against either the Germans or second-placed Poland in their final two games would secure Ireland at least a play-off place at next summer's finals. Anything less could prove fatal to Irish hopes of qualification. "They are class players, and it will be a tough night for us. But we're ready for it," said O'Neill. Joachim Low's German side suffered an uncharacteristically low-key start to their campaign. They lost in Poland and drew at home with the Republic in their second and third qualifiers, but have put together a run of five successive victories since to illustrate their enduring class. 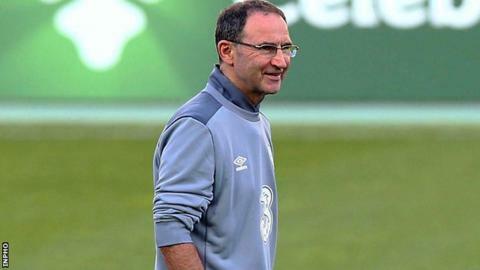 O'Neill said: "They're very strong, naturally... they're getting back to winning ways". "They've had what they might consider a couple of hiccups along the way, including one against us. "But we know what we have to do. It's a very difficult game for us, but we're capable. We have to go with all the enthusiasm and determination that that brings. We've got a bit of ability as well." O'Neill will hope to draw once again on the spirit which secured a 1-1 draw in Gelsenkirchen 12 months ago when John O'Shea's injury-time equaliser snatched a potentially invaluable point. However, Germany's last visit to Dublin in October 2012 saw them crush Giovanni Trapattoni's side 6-1 in a World Cup qualifier. "I think the best thing to do is give it everything you've got in the game and have no regrets at the end of the game," O'Neill stated. "We have to be as positive as possible and attempt to go for the game." O'Neill, who worked with his players for the first time on Monday morning, will be missing midfielders Glenn Whelan and James McClean through suspension and injuries threaten the participation of several others. Defender Marc Wilson is yet to meet up with the squad after staying behind at Stoke for treatment on a calf problem, while Everton full-back Seamus Coleman and Derby's Cyrus Christie did not train with the rest of the group. Coleman's club-mate Darron Gibson was a late addition to the squad as he battles his way back to full fitness after a knee problem. Training will increase in intensity as the week progresses ahead of a contest in which O'Neill knows his team may have to play without the ball for long periods. He added: "I don't think that is something the players are not used to. In international football, that sometimes happens."